President of the Senate, Dr. Abubakar Bukola Saraki, on Tuesday canvassed for global support for Nigeria in the area of renewable energy and said the country stands to benefit in terms of job creation and affordable power supply if well harnessed. Saraki also gave kudos to the United Kingdom parliament for collaborating with the nation’s legislative bodies in putting resources and relevant laws in place for the benefit of the people. Speaking when he hosted a delegation from the UK Parliament led by MP, Kate Osumor, in his office, Saraki said the challenges facing the nation at the present time are surmountable and urged Nigerians to join forces with the present administration in finding lasting solutions to present economic, social and security challenges. Highlighting the significance of renewable energy to the country, the Senate President pointed out that the sector when fully tapped will boost job creation as thousands of unemployed youths will be engaged and become useful to the nation. He added that with renewable energy, and the support from the international community, issues of epileptic power supply in the country will be a thing of the past. 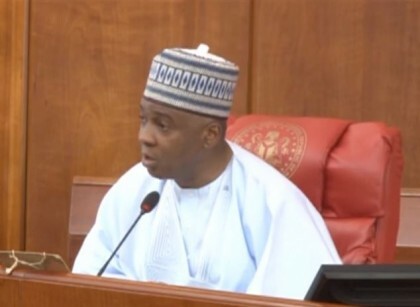 In doing this, Saraki said that the desire of the 8th Senate in particular and the National Assembly in general is to ensure that government policies and ideas are in tandem with the aspirations of the masses. Saraki said: “It is our desire to make sure that things start to work properly in our country. We do believe that no matter how huge our challenges are, we are going to overcome them with right thinking devoid of any interest. Even, in the face of such interests, we should continue to work as one indivisible nation. “I am confident that the resources and commitment of this administration will in the long run be of great benefit to the common man and take our nation out of the woods,” he said. He also expressed confidence that the existing bilateral relationship between the country and United Kingdom will be strengthened considering the robust partnership between both parliaments. Earlier, the leader of the UK Parliamentary delegation, MP, Kate Osumor said that what is crucial to the team is to ensure smooth communication between both parliaments and to bring international cordiality between the two nations. Osumor stressed that the world is getting smaller and closer as a result of technology and noted that improved bilateral relationship would enhance the achievement of developmental goals.